Stockpro Portable Sheep Yards give you the flexibility of working with your sheep where ever you need to. Our portable sheep yard systems are safe and easy to tow whether on rough farm grounds or on public roads. 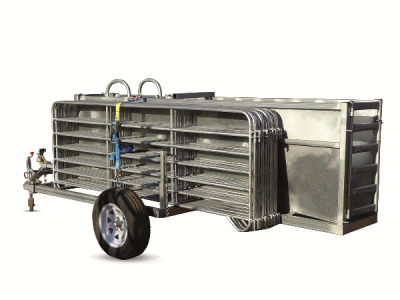 Built with experience, our portable sheep yard systems are designed with the needs of livestock and handlers in mind. They can be set up in as fast as 30 minutes. We have varying sizes available, suiting the needs of mid-range to large operations. Whether you are leasing a property for a short period of time or require a system that can be rearranged for different types of operations, you can rely on our system. Stockpro Portable drafting module and portable panels can be set up in any design to suit your requirements. Our drafting races are 100% Australian-designed and made, ensuring quality built to withstand Australia’s harshest conditions. Manufactured in-house, our portable sheep yards are made to the highest standards with exceptional quality control. 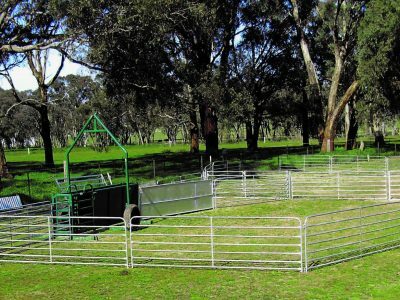 They are built to offer the benefits of permanent sheep yards with the added benefit of transportability. For inquiries, contact us on 1800 354 415 for a chat with our friendly team. Spreader Bars, Ratchet Strap and Two Sheeted Panels.